The term double outlet right ventricle (DORV) refers to a heterogeneous series of associated cardiac anomalies involving the right ventricular outflow tract. It follows cases where both great arteries predominantly arise from the right ventricle. The alterations in morphology of the right ventricle can vary. A DORV presenting with the great artery transposition causes 26 percent of all cases of this condition. The aorta is located inside and to the right of the pulmonary artery. The blood is diverted to the right ventricle. Pulmonary veins then drain into the left atrium and the blood oxygenates in the lungs. Profound cyanosis and fulminant congestive heart failure are some of the main manifestations of this disease. Treatment is aimed at correcting the combination of specific anatomic malfunctions. There are 4 categories of DORV, depending on the location of the ventriculoseptal defect (VSD) in relation to the great arteries. These categories are DORV with sub-aortic VSD, DORV with sub-pulmonary VSD, DORV with doubly committed VSD and DORV with non-committed VSD. The variant with sub-aortic VSD is most common. The degree of pulmonary stenosis defines the pathophysiology. The pulmonary stenosis causes decreased pulmonary blood flow. In its absence, the blood flow becomes increased, causing heart failure. The sub-pulmonary VSD the PA preferentially receives oxygenated blood from the left ventricle. The desaturated blood from the right one travels to the aorta. Doubly committed VSD is specific for the absence of the infundibular septum which leaves both aortic and pulmonary valves to the VSD. The last one is the non-committed VSD. It is located further away from the aortic and pulmonary valves. Patients with non-committed VSD often undergo single ventricular palliative strategies. Physical examination will involve the observation of the cardiac valvular sounds. It will include tests for murmurs and thrills, the point of maximal impact and heaving of the chest wall. Any abnormal pulmonary and peripheral signs of cyanosis and capillary refill will be sought. DORV is a disorder that will not resolve itself without surgery. Palliative operations are performed on patients who need a short-term intervention. Non-cardiac disease is managed at times when anatomic features disallow a definitive correction. 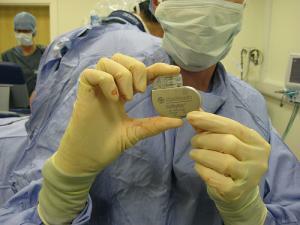 Ideally, a repairing of the DORV is a corrective procedure leading to the biventricular repair. The left ventricle is connected to the aorta, while the right one is connected to the main pulmonary artery. In case of excessive pulmonary blood flow, banding of the pulmonary artery is used palliate this flow and protect the pulmonary vascular bed. In the case of inadequate blood flow, an aortopulmonary shunt can palliate inadequate flow. It will also promote the growth of the pulmonary vascular bed until total management. dysphagia and dysarthia FOR BETTER TREATMENT?? ?